The debate over whether tabs should go on the top or the bottom of a screen has raged for nearly a decade. Android has always preferred to use tabs as a filtering mechanism on the top of a page, while iOS has used bottom tabs as the main source of navigation. Now, with the addition of the Bottom Navigation View in the Support Design library, Android developers have the choice of where their main navigation comes from in their applications. Bottom navigation bars make it easy for your users to navigate through your top-level views with a single tap, compared the the navigation drawer that flies out from the side and has been a standard when there are a lot of different sections to an app. Today, I’ll walk through when it’s best to use bottom navigation in your app, how to implement it, and how to customize it to your liking. Does your app have 3–5 top-level pages? Do your top-level pages need direct access? If your application has more than five pages, it’s best to stick with the navigation drawer; if you have less than three, stick with standard top tabs. To get started with the new Bottom Navigation View, we’ll want to make sure that we have our Android application updated with an AppCompat Activity and upgraded to the latest Support Libraries. With that, we can now install the Xamarin.Android.Support.Design NuGet package (current version 25.3.1) into our Android project at our set up. We must define the items that will be displayed before we add the BottomNavigationView control. This is controlled similarly to the NavigationDrawer, with a menu defined in xml. We can create a new menu folder in the Resources directory and add a new xml file. I created bottom_navigation_main.xml in Resources/menu/ and downloaded a few tab icons from the Android Asset Studio, which are 24dp x 24dp. We can define an elevation so the bottom navigation is lifted off the page with a nice drop shadow, and we define our items in the navigation view with the menu property that is referencing the menu we created earlier. As we can see, the default will automatically apply our primary color and gray out the deselected items. 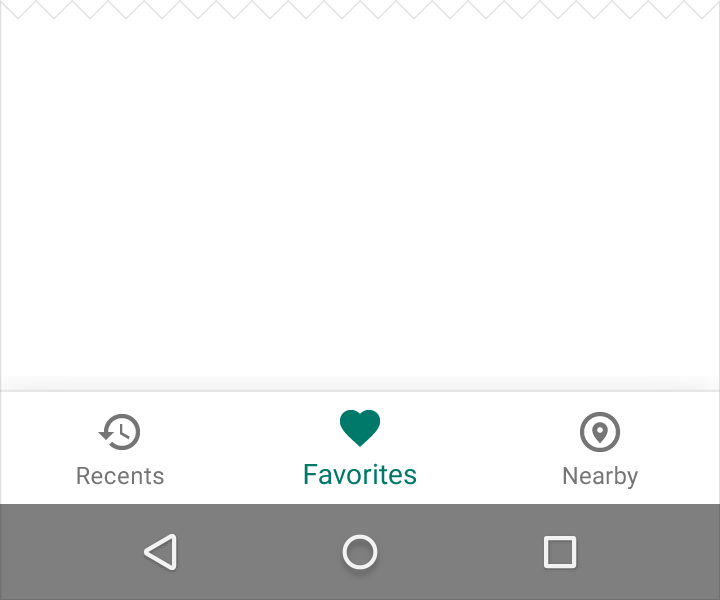 To learn more about bottom navigation in Android, be sure to read through the Material Design Guidelines for all the “dos and don’ts” of using it. You can also grab a full sample and other samples of navigation from my GitHub repo.